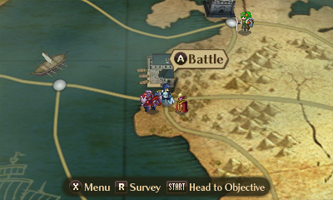 Normally, skirmishes–optional battles on the world map–involve a single enemy group. However, on rare occasions you might find two groups positioned in the same location. If you begin a skirmish with travelling merchants present, the merchants will appear in battle as NPCs; clearing the skirmish with all merchants unharmed nets you a random item, including Brave weaponry, stat-boosters and etc. If you fight a skirmish with two enemy groups present, you’ll end up fighting both groups at once; surviving this onslaught nets you a random item and 3000G. 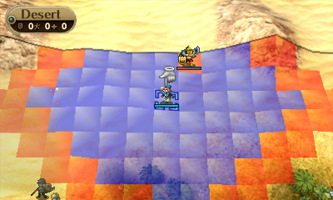 It’s even possible to find StreetPass or SpotPass Teams mingling with the enemy–if you enter one of these skirmishes, the StreetPass/SpotPass Team will participate as NPCs to aid you in battle. This is all rather fun, but be warned that any items won by NPCs cannot be recovered! To obtain this wonderfully named Mystletainn replica, you need to make Owain talk to the south-eastern villager in Paralogue 5. If you missed this opportunity, you can obtain another Missiletainn in the DLC episode “Infinite Regalia“. This elusive staff can be in obtained in Paralogue 14, by following a rather long-winded quest. Move here to find the fabled mirage village! To begin with, visit the north-eastern village. This will trigger the appearance of another village the following turn. After visiting the final village, have a character wait on the tile 2 down and 1 left from the boss’s position (or 4 right from the north-western Event tile) to be gifted with the Goddess Staff. Just like the Missiletainn, if you miss the Goddess Staff, you can obtain another in the “Infinite Regalia” episode. The much sought-after Boots item permanently raises a character’s movement by 2 points. You can obtain one set of Boots from the most north-western chest in Chapter 17 and another set by obtaining 50,000 Renown. Besides these two routes, there is no other way to obtain more Boots in the same game file. Furthermore, you can’t use Boots on the same character twice. Through clever usage of the “Avatar Logbook”, it’s possible to effortlessly and endlessly raise the stats of legacy characters (recruited from SpotPass or DLC) or guest Avatars (recruited from StreetPass). You’ll need at least two game files for this, which I’ll arbitrarily refer to as file A and file B. 1. Load file A–this should be a file with numerous stat-boosters (e.g. Energy Drop) and plenty of gold. 2. Feed your character of choice stat-boosters until they’re all depleted (or you’re happy). 3. Update the character in the Avatar Logbook and save your progress to file B. 4. Load file A and recruit the newly-updated character from the Avatar Logbook (requires gold). 5. Go to step 2 and repeat the process until necessary. If you need gold, the easiest source is the DLC episode “The Golden Gaffe“, although that does require you to fork over real cash! Theatre – Watch any of the CG movies from the game. 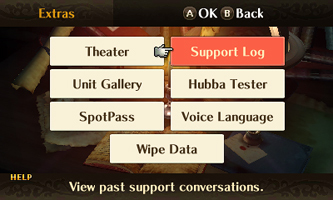 Support Log – Re-read any of the support conversations you’ve seen. Unit Gallery- Check out your units’ battle animations (also includes a Sound Test). Additionally, when you begin a new game file, the new file will automatically carry over the highest Renown out of all your cleared game files. You can also carry over your Avatar and legacy characters (from SpotPass, StreetPass or the DLC) from other game files by using the “Avatar Logbook” (you can actually do this at any time, once you have access to the logbook), although you’ll need to pay gold to actually summon these characters again. 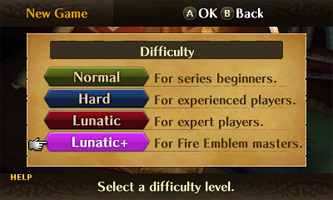 After completing the game on Lunatic difficulty, the Lunatic+ difficulty will be unlocked. Lunatic+ is essentially the same as regular Lunatic, but enemies may possess terrifying Skills, which are unique to Lunatic+. Note that to play Lunatic+ on Classic Mode, you must beat Lunatic on Classic Mode too. The DLC episode “Infinite Regalia” features 3 treasure chests, each containing a random powerful or legendary item. Like all the DLC episodes, you can replay this episode as many times as you want to complete your collection of legendary weapons! DLC-phobic fans need not worry as every single item in Infinite Regalia can be obtained outside of this episode and for free.